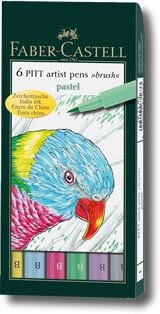 Faber Castell Pitt Artist Brush Pens are one of the nicest brush pens on the market with 58 brilliant colours of waterproof, lightfast and permanent high quality Indian ink which allows the picture to be worked over when dry. The light brush pen colours are transparent so are great for various varnishing techniques and the darker colours have great covering capacity. Faber Castell Pitt Artist Brush Pens are great for all types of surfaces including canvas, fabric, wood and ceramic and glide softly and smoothly over paper. This set contains 6 pastel colours.